Yes Kiran, your summary correctly replicates what I tried to describe. But please be aware that I am only proposing this as a 'theoretic' perspective that can be used to understand things more properly from a fundamental point of view. Yes Kiran, one can always get confronted with fingerprints where one is required to make a decision on subjective grounds when the details include ambigue aspects. 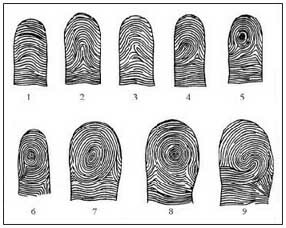 By principle, fingerprint classification has the potential to be treated as a 'hard science'... and this is essential, because this also partly explains why fingerprints came to play a significant role in the forensic sciences! However, Richard's method includes factors that by principle should not play any role in fingerprint classicifcation at all; and the result is that Richard might qualify a perfectly normal 'loop' as a 'tented arch' - only based on the entirely subject element of the location of the core of a loop. And meanwile the consequence is that in many of his 'tented arches' the rest of the world would probably immediately agree about that it can only represent a 'loop' (based on the FBI method). PS. Kiran, I also hope you will recognize how this problematic aspect in Richard's method has huge implications... because this implicates that Richard will assess many loops as a 'tented arch'! And we (as non-IIHA students) can hardly oversee how this factor has played a role in his decision to associate the 'tented arch' with air... and not with fire, and the whorl with fire... and not with air. But I think Richard is misjudging things dramatically when he says that he thinks that he would be able to convince Noel Jacquin regarding the validity of Richard's method... because I would expect that Jacquin would probably in the first place question Richard's method regarding the tented arch... because Richard has never explained why he thought it was necessary to adopt such a subjective element in the proces of fingerprint assessment. He basically only claims that his method works... but I can at best only recognize that as a by nature entirely subjective argument (that basically closes every door to enter a more advanced discussion). I'll reply to the other post later. Knowledge is useless if you don’t use it. If you are in the School of Wisdom, using what you know in an active, engaged way is your homework. What do you need to really decide upon and commit to? Taking action on an important decision is wisdom. For example, deciding to have a child and re-arranging your business and personal life in advance of the baby’s arrival is the exercise of wisdom. We don’t always use what we know, but when we do, life sometimes rewards us with clarity and ease. So, I think, in this sense, TA is related to fire and actions only and not to air qualities. (Leave apart the association with TA - Fire/Air and Whorl - Air/Fire between RU and his students). The point is TA is related to action only. If you would ask Lynn or Jennifer which element relates to 'wisdom', I would expect them to say air first, and earth second; because in Jennifer's book the word 'wise' is ranked under air (page 34)... and the word 'wisdom' is ranked under earth (page 14)!! So, everything depends on how the conceptual definition of the elements; and Richard probably did not pay much attention to that... because otherwise some his students would probably not have started working with the traditional principle (where tented arch = fire and whorl = air)! I think the essence of wisdom is a combination: the study of knowledge + the application of knowledge. And I would say that 'fire' is not about the STUDY of anything at all, which by principle more relates to air; and since wisdom starts with the study of things... I think by principle it can not be assocated with 'fire'. Therefore I can understand Richard's + Janet's use of the principle: tented arch = air... because in the IIHA school the 'tented arch' is associated with wisdom!!! However, in the other hand reading schools this connection between the tented arch and wisdom can not be used... simply because the tented arch is connected with fire! So, I don't think there is any other author (before RIchard's work was published) who has used a concept that can be connected the tented arch with wisdom. I agree Knox. It's a result of experience. I think Baeth's example for wisdom=fire is an odd one. I would describe the basis of the actions of a mother planning the birth of a child as 'wisdom' if she's gone through the experience in some way as to become wise. Otherwise she is making 'smart' decisions, but not decisions made on wisdom. Action does equal fire energy but wisdom has nothing to do with fire energy (alone). Wisdom would be the air(knowing),water(understanding), earth(practical,realness), result of fire(action/experience) energy. But, this opens up another another direction altogether rather than resolving and understanding the difference at the first place. as per new theory: Whorl - Fire; DL - Air; Based on the core. I feel, it will be good to first resolve the difference or understand and come to a common ground on the difference before proposing a new theory. Is this still followed Martijn? Do you more info on this from RU and can this be share here, if its permitted to be shared? But, logically, it should be the other way round, that the TA should be possible to be applied on hand and not on paper. As on paper, it would appear correctly(as my hand would be placed in 90 degrees) against paper! Martijn, are you saying that, like the way he has associated loop with TA and vice-versa, he has made a subjective assessment on TA being Air and Whorl being fire. Am I right? Yes, I too don't agree with what Beath is giving as definition for wisdom. Hence, if we look in this way, the school of wisdom is action related and so, RU's system of TA assignment matches with 5E system. Yes Patti, I understand your point: connecting fire with wisdom is a rather strange connection indeed from a fundamental point of view (and that is probably the reason why Richard is not using Baeths principle). However, I do understand why Baeth made that connection; because her principle does appear' to make sense in an attempt to combine 2 systems. First, when one starts reading Richard's book... one soon finds the concept that 'the school of Wisdom' gets associated with a tented arch. That's step 1. Then second, since Richard does not work with the elements in his system (afterall, he does not mention them in his book)... I understand that some of his students started making the connection with the elements via what other authors have written in other books about fingerprints & the elements. And obviously, the classic principle says: tented arch = fire, etc. That's step 2. And thus this is how step 3 becomes: wisdom = fire! So, in my view... in a way, Baeth's principle is not odd at all - because her principle is the result of combining IIHA teachings with the elemental fingerprint principles used in Elemental Chirology! However, I also understand why Richard has created the alternative principle: tented arch = air, because if one starts thinking about what the concept of wisdom is about, one should be able to recognize that the 'intelligent' nature of wisdom does not fit with the 'impulse-like' concept of fire (as described in elemental hand analysis). So, this appears to indicate... that it is actually impossible to combine the principles used in IIHA with the principles used in elemental chirology! (Maybe because Richard has not managed to present a sensible system to his students - afterall, the whole concept that life has an individual purpose for individuals is probably a matter of 'belief', and not a matter of fundamental 'logics' - therefore it is not surprizing to see that his students start making connections that may appear 'logic' at first sight... untill one starts thinking about the fundamentals, because only then is becomes possible to recognize that the principle 'fire = wisdom' is acually incompatible with the fundamentals of Elemental Chirology! PS. To me this is a nice example which illustrates that it is by principle important to work with 'consistent' principles... in order to build a coherent system. Well Kiran, to me it is obvious that it is quite impossible to combine the principles used in Elemental Chirology combined with the principles used by Richard (or vice versa). And thus I am not sure that there can be much 'resolved' between the two systems... unless one proposses some kind of new type of principle that makes a connection with both systems! - Alternative option: One can explore the possibility that both systems might include an interesting point... but I think that would require first to explore whether there might be some other 'senisible' principles that has yet to be explored! So Kiran... I think it is important to use a sensible 'strategy' to explore things before making any further attempts ahead. And I think I have already described how such a strategy could look like. And I think the principle of the graduated materiality could be an interesting theme to explores the possilities further from a more fundamental point of view! Because I do think that Richard's principle 'whorl = fire' does makes sense to me in various perspectives... for example (just to present an example): males tent to have more 'fire' and more 'whorls', while females tent to have more 'water' and more 'loops'. (Only Richard's principle 'tented arch = air' does not make much sense to me at all; but I could also make a likewise point regarding the principle 'tented arch = fire' used in Elemental Chirology... because the tented arch is probably far too rare in order to associate it with fire + in the principle of the graduated materiality fire is not positioned BETWEEN earth and water...!). Well, about 3 years ago I had a lengthy detailed email conversation with Richard about this topic. I think I still have it in my email system... but I don't think it is necessary to copy anything from it to this discussion; because if one becomes aware how handprints are made and especially that fingers are pushed against the paper to make a full print of the finger tipe... then if one starts considering/visualize the details then one should immediately become aware that even 'twisted fingers' should become a factor in any decision process about whether a triradius is located at a central point or whether it is located as a point to one of both sides of the fingertip. By nature such a decision is an entirely arbitrary (subjective) process... that can not be combined with the principle used in for example the FBI system for fingerprint classification - who are historically recognized as the leading authorities for assessing fingerprints! Well Kiran, I can only especulate about this. But I think Richard is intelligent enough to understand that Baeth's principle (fire = wisdom) can not work... even if she would claim to have received positive feedback! And thus, from a fundamental point of view... Richard probably recognized that he had to develop another priniple. However, fortunately, Richard is aware that his principle is not in line with Jacquin's work - because that is what he has pointed in Mark's blog. But I am not sure how Richard has tried to validate his choices exactly. I can only say that his method regarding the 'tented arch' is rather arbitrary by nature.So, yes... by principle I do think that one can say his tented arch method represents the start of a rather subjective validition process. Because he is basically also using the argument that one needs to have the person in front of you in order to make an exact assessment according Richard's principles. While in the FBI method the criteria for recognizing a tented arch can always be verified via paper of via a photo(scan). Kiran, in my email conversation with Richard he has also informed me that usually his students don't start wondering about this fundamental issue. And of course, one can not expect Richard's (inexperienced) students to wonder about the fundamentals of Richard's method; because it actually takes time to become familiar with the method! Obbviously, this is advanced stuff... and I would probably not be able to formulate my problem with Richard's 'tented arch' method when I had not studied the FBI method by detail! I hope this is helpfull, Kiran? Kiran.Katawa wrote: Yes, I too don't agree with what Beath is giving as definition for wisdom. Yes Kiran, I understand what you are trying to do... but that only works IF one does not consider the full nature of 'wisdom', then one can start making likewise 'associative' connections as the one described by Baeth (where she connects fire with wisdom). NOTICE: It is quite impossible to describe 'wisdom' in terms of action-related terms only (because wisdom does not start in action... basicaly one can say that it ends in action - however, just like Knox described: wisdom is a 'multi-layer process', where the action represents only one of the layer-components!. So, I think... when one starts making connections between 2 systems, it is important to respect the fundamental princples used inside both systems.... and I think this requires some process of thorough thought & wondering. And Richard's principle (tented arch = air)... sort of proofs that in his system one can not connect 'wisdom' with fire, because otherwise Richard would have used Baeth's principle - but obviously, Richard does not use it: because Janet's description that you mentioned is an illustration for this as a fact! I recognize the issues with a printed fingerprint of the loop with a central triradius, especially one that isn't rolled as done by the FBI. Yet, from mostly looking at fingerprints on hands in front of me, I would agree with Richard that the loop with a central triradii is a different creature than the loop with the side triradii. Purkinje placed this pattern between the tented arch and the loop in his set of nine types of prints. because the tented arch is probably far too rare in order to associate it with fire + in the principle of the graduated materiality fire is not positioned BETWEEN earth and water...!). The point you say makes sense Martijn. But, these are based on the statistics or observations and not on fundamentals. When I say fundamentals, I am referring to something like No. of tri-radiee or core or anything like this. Yes, you do associate your new theory w.r.t. the no. of cores and the flood gate of complexity opens up! I do agree very much with you on the complexity of this matter. I think, we are in the beginning of this exploration. Though, there is literature on fingerprints, but, this kind of comparision study b/w 5E and RU's system is rare. Though, I don't have any substantial points to say where a common ground can be found, I don't want to go with the - 'impossible' conclusion. The only thing is, RU might have thot of something and have experienced in his readings that what he says has come out to be correct and its been cross-verified by many of his students too. And same is with 5E system from BCS and its students. Though not related, just FYI - though not for finger prints, RU does follow elemental principals in hand readings. As Patti always suggests, if we remove the 5E assignments, the descriptions between 5E system and RU system would get in sync. I have to visit the chapters on TA and W in Ronelle's books to comment further. And where do you place 1 triradii + no core combination? whorl = air (RU), fire(beath). NOTE: But, both Beath and RU agree on school assignments. service, which is assigned with air element, doesn't resonate correct. 3. Loop being read as TA based on the tri-radii's positioning. The FBI system was simplified for common ease of use and absolutely not for character assessment. Galton's earlier system involved looking at what formed between the parting of the ridges on each side of the fingertip. Purkinje's larger number of examples and Galton's ideas were abandoned for Henry's simpler method which clumped several variations into smaller groups. Interestingly there was a lot of competition in the fields that related to identifying and cataloging body parts in the late 19th Century into the Twentieth. The underlying drive then was eugenics. In the past few decades the driving force to our understanding the development of hands has been largely due to funding from the 'right to life' people. I bring this up because it's important to remember the agenda behind the motives for claims and for labels. This was a statement I was looking for.